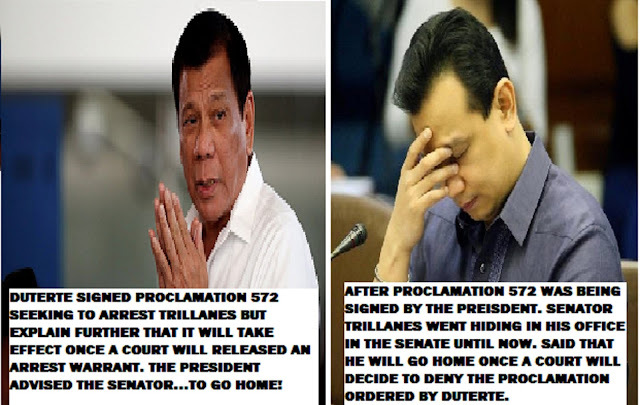 President Rodrigo Duterte said that he is not interested to arrest Senator Antonio Trillanes who is now hiding in his office in the Senate. Duterte signed a Proclamation 572 seeking his arrest immediately after finding insufficient requirements to validate his granted amnesty in 2010. The president also made clear that even the military is not interested in arresting him. Duterte said that Trillanes should go home since no warrant of arrest has been released. There was two court in Makati were assigned to validate his amnesty. Branch 148 ruled a decision to not yet released a warrant of arrest and hold departure order. While Branch 150 has to be ruled on the same case and matter, the decision is within today. The cases were against his participation in Oakwood Mutiny in 2003 and Manila Peninsula in 2007 against the regime of former President Arroyo.